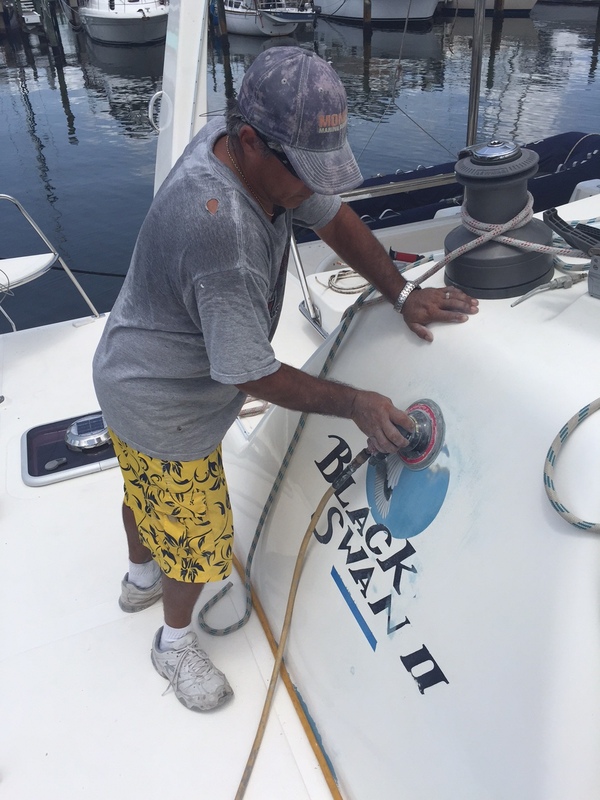 The SV Aphrodite (our catamaran) continues to be awash with refit activity. Our refits touch on all aspects of the boat. To start, here is a view of the exterior of our catamaran. In the photo above, Brad, who is heavily involved with the refits, is going up the mast. Pat Reischmann of Hy-Tech Marine is standing to the left of the mast in the yellow shirt. Pat has built more than 200 boats, and was one of the visionaries behind Manta Catamarans. He has been advising us during our refit process. Pat has another client at the marina that we’re at in Bradenton, Florida. 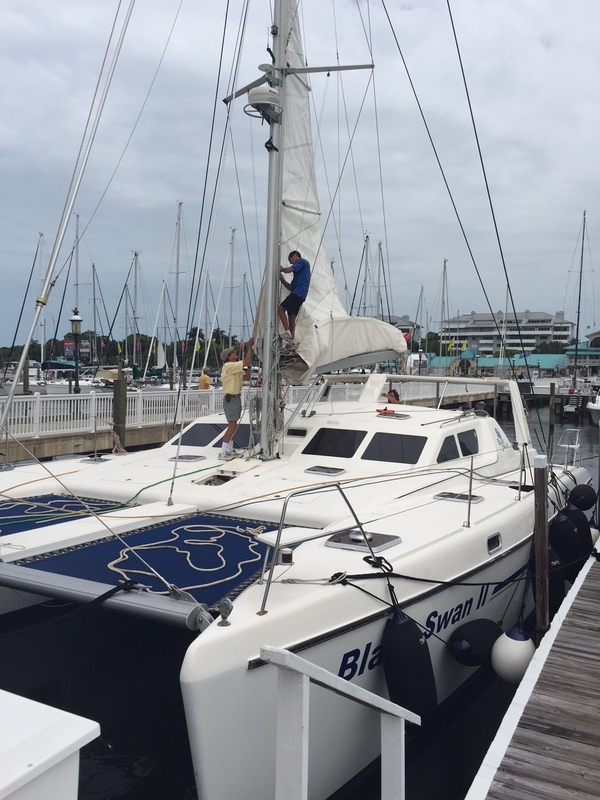 They own a Helia catamaran, and are also doing a refit. Below is another picture of the exterior of our boat – this time, showing the old logo as it is being removed. As I have mentioned before in my blog, we have officially renamed our boat SV Aphrodite, which was its original name when it was first launched in 2005. Old logo has been removed. Stay tuned for the updated artwork for SV Aphrodite. 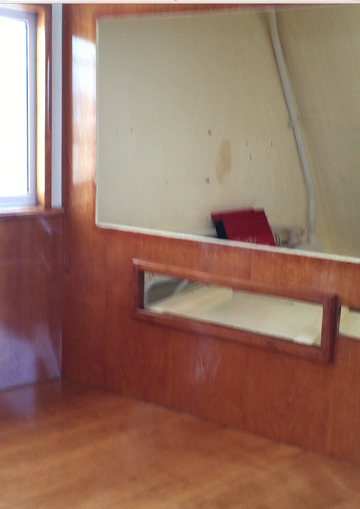 Inside, parts of our boat look gutted. For example, the television has been taken out, along with a outdated car stereo. 30 inch television, DVD player and car stereo have been removed. Deemed to be too heavy and outdated. Also in the saloon, the leather saloon seats were removed today for refurbishing. If you wanted to use the bathrooms right now, you would be out of luck. There is no running water at the moment. Fortunately, our boat is located very near the marina bathrooms. We are replacing the water pumps. And the stove top has been removed to allow for the Corian countertop to be refinished. This limits meal options to microwavable dinners, sandwiches and cold cereal. My husband has been taking lots of video, largely for the benefit of our cabinet maker, Derek. Because Derek lives in Victoria, B.C. these videos provide him with a sense of the work to be completed when he comes to work on our boat in early July. I enjoy the videos too because I live in Ottawa, and haven’t seen the boat in person since early April. One of the videos shows the master berth filled with boxes of parts, including the new solar panels. Spools of wire lie on the floor. I asked my husband about the spools of wire. He said the wire was being laid-out to connect the new alternators to the batteries. The new alternators are 200 amps, whereas the old alternators were 80 amps. While we preserved the original wiring, we needed thicker wire to carry the extra energy to the batteries. He tells me that the wiring is now complete, and the spools of wire have been removed. Work is happening in parallel. During the day, our boat is a hub of activity. And, my husband has been meeting contractors, and researching and ordering parts full-time. He gets home from Florida tomorrow.